Voting day should be a pleasure. There’s an even better Soviet picture in the Malaga satellite of the Russian State Museum in St-Petersburg, though I stupidly neglected to take a photo. It’s of an election day parade: with pretty blonde peasant girls on a cart, flowers, sun and general bonhomie. Of course these were phony elections. 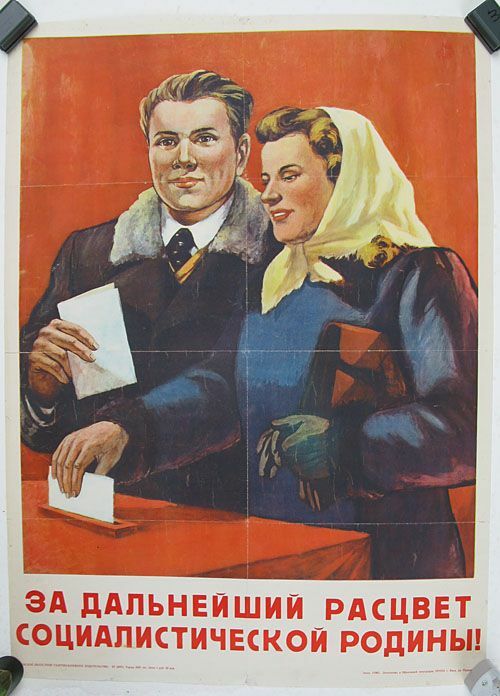 Still, the Russian Communists felt the need to hold them throughout their autocracy, and the voters turned out. The Communists did not dare challenge the idea of democratic choice, even while subverting it completely in practice. Here’s Hogarth on the elections to Parliament of 18th-century England, based on the 1754 one in Oxfordshire. This is the last of a series of four, and shows the victorious Tory being chaired through the streets to celebrate. These were real elections: exceptionally corrupt and messy ones. The common element with the pretty Soviet fraud is that both were fun. This is a virtue in elections, and worth planning for. I’m not talking about the campaigns. The American quadrennial election campaign is out of control in length, cost and human burdens, and I don’t have good ideas to fix it. But it would be quite easy to make election day a civic festival rather than a gruelling obstacle course. Four hour queues? WTF, in a country that has put men on the Moon? They manage it in in Dixville Notch (Clinton wins by 4 votes to 2! ), and it can be done in Philadephia too. 1. Move voting day to Sunday, as in Spain. Getting time off on a working weekday is a real issue for many Americans. The shambolic polling organization in far too many precincts compounds this class- and race-biased disincentive, often not accidentally. 2. Throw a party. Close many streets to vehicle traffic. Organise parades, marching bands, street concerts, jugglers, puppet theatres, prize vegetable shows, fireworks, and beauty contests. You could even let Donald Trump help with these, as long as you kept him out of the dressing rooms. 3. Make voter registration a duty of the state. It’s far too late to complain about government keeping databases of the citizens. You don’t apply to get into those run by the IRS or Social Security, they find you. My grandson Jayson, born in England, got his NHS number from the hospital, before his birth certificate: it will follow him through his life. 4. Cut the ballot length. Make it more difficult to get initiatives on the ballot. Prune the list of dog-catchers: there’s only so much democracy people will engage with. Six questions, no more. A waste of money? The USA is terrible in international comparisons of national voter turnout. It ranges from up to 55% in presidential-year elections to 40% in off-year ones. 23 countries are at 80% or more, peaking at Malta’s 94%. (Surprisingly, Switzerland is down with the USA at 54%). Only seven of these have compulsory voting. Wikipedia does not reveal how many of them have Sunday voting or street parties. It stands to reason that if I had foreseen the grim disaster the 2016 election would turn into, for American women, minorities, immigrants, and the poor; for the climate and the billions affectedÂ by its deterioration; for the world economy; and for keeping the peace with Russia, China, North Korea, and Iran while deterring aggression with a prudent determination, I would not have published this post. Still, I wrote it and its cowardly to disown your own work unless it’s needlessly offensive or based on major errors of fact. Not that I was wrong, just out of place. There is one way the post is still relevant. The surprise was one of turnout: not, as we had hoped, of shy Democratic urban voters energised by a superior GOTV effort, but it seems of shy white rural Republican ones taken in by false promises and the reporting failure of the media (a disturbing parallel to Germany in 1933). Many had apparently treated pollsters like telemarketers and hung up. Such ambushes and surges are more likely in countries with low turnout in elections. In the long term, policies to raise turnout to the OECD average – including ones to make the experience more pleasant -Â would make American democracy more stable and legible. Intelligent voting presupposes knowledge about the priorities and intentions of one’s fellow-citizens. Two things of note in older paintings of election days in the US and Britain that you don't mention are that candidates often plied voters with free drinks and voting was done in public, often under the gaze of one's employer or neighbors—maybe not so much fun, after all. Bingham's painting of an American election, the first I found, doesn't emphasize either, though. 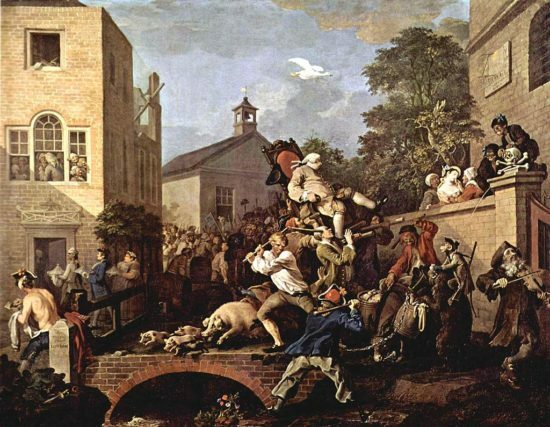 Hogarth covers the free food and booze in the first painting of his series, "An Election Entertainment". Not putting elections in charge of partisan officials who actively want to suppress the vote is step 1. Voting has always been fast, easy and convenient for me, but I live in a middle-class, mostly white neighborhood in a relatively liberal state. Most of our problems occur simply because people in power actually do not want people to vote and are deliberately doing everything they can within the letter of the law to prevent it. Even "little" things like giving working people enough time to go to the polls have been hard-won (and mostly sidestepped with early or mail-in voting). When the motivating force for your base is fear of what the other party might do rather than joy at what yours intends, then it's hard to make elections happy events. Tragically, it seems you are absolutely right about the 2016 election. As with Brexit, the next four years will be one long We Told You So by people like us. Madison's worst fears about democracy have come to pass. Which is amusing, in a grim way, since it's Madison's ideas about government that led to a system in which Republicans can gleefully blow things up while Democrats take the blame for it. The NYT live updater just now gives Trump 264 electoral votes from called states, with Arizona's 11 not yet called but pretty certain for Trump. It looks like it's over. God help America, and us all. "A Republic, if you can keep it". Can you? I have been feeling uncomfortably like my grandfather today. It's troubling when your fondest hope is that the winner won't do any of the things he campaigned on. When I voted at about 3:30 today, there was (as usual) no line. New Jersey seems to be better in this regard than a lot of states, but according to the AP, "at a polling place in Jersey City, voters reported waiting outside of a fire house for more than an hour." My town is reliably Republican. For example, Republican Senate candidate Jeff Bell got 63% of the vote here in 2014. In that race, Democratic candidate Cory Booker carried Jersey City 87% to 13%. Well, this one was a real chuckle.